Gratitude, gratitude, gratitude. With Thanksgiving coming everywhere you look it’s gratitude. On TV, in the news, social media, etc. Don’t get me wrong, It’s a great topic and an even better principle. I guess I just get tired of seeing it come and go once a year. 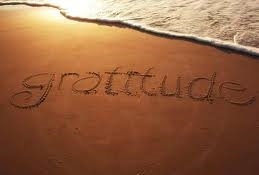 Gratitude, to me, is something that should be practiced daily, year round. Of course it is a good thing to discuss and teach your kids during this time of year but my philosophy is that children should be raised to be grateful human beings. That is how I teach my kids about gratitude. Of course with kids you need to first discuss it and teach them what it means but you instill the concept and raise grateful kids by acting in a way that shows you are grateful yourself, reinforcing the lesson. As I am sure all you parents know, kids do more of what we do, not what we say. As hard as it can be at times, I must always remember that the greatest teachings from me are going to come from my own behavior that reinforces the lessons I try to teach them with words. These lessons are the ones that will have the greatest impact on their development as human beings and citizens of the world. Go-Go Babyz can be very trying at times. Running a small business is not an easy task and there good times and tough times when it can be hard to find any reason to be grateful. But what kind of teacher am I if all I do is complain during the rough times? I have to remember that their eyes and ears are always on me when they are around whether I think they are or not. So I need to be aware and remember to show my appreciation for Go-Go Babyz and how lucky I am to have the opportunity to be part of a family business even if things aren’t going my way. So for me, gratitude in an attitude; a perspective based on a principle that needs to be practiced. Practice is an action word so the best way I can raise grateful kids is to act in a way that tells them I am grateful and in turn shows them how to be a grateful person. For me it takes practice. I am not perfect and don’t act right all the time but I know if I can practice on keeping my perspective good, the right actions will come and before I know it, I have a couple of truly grateful kids. Halloween has come and gone again and that means before you know it we will all be gathered in front of a tree opening gifts with our kids. Time seems to go by faster and faster every year. I hope everyone had a fun and safe Halloween last week and that your dental visits didn’t increase due to all the candy. Candy is funny. 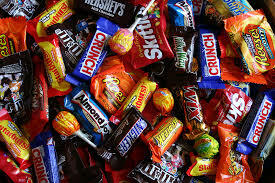 I like candy sometimes as do my kids but at Halloween you would think that my kids have never seen or eaten a piece of candy and that it’s some sort of rare, high valued currency. It’s all about how much candy they can get. As soon as we get home from trick-or-treating the bags are quickly emptied on the floor and they start sorting them all to see what and how much they got. Then they quickly move in to the trading phase. I guess they first need to see what they have to work with before they just start trading. I remember doing the same thing. I separated everything into piles then further sorted them by creating the discard pile of all the candy I didn’t like and the mine, mine, and all mine pile with everything I wasn’t about to offer up for any sort of trade. Unless, of course, someone was lucky enough to get the king of candy currency, the full-sized Butterfinger! Anyway, I would eat a few (or twenty) and hide it away. I would eat some here and there the next few days and then it just sat. And sat, and sat. My kids do that too. They are more excited about getting the candy, and as much of it as possible, than actually eating it. So it appears the fun is in the trick-or-treating and comparing the loot. I guess I shouldn’t complain about that; less dental bills and kids hopped up on the S.
We can’t forget about the dressing up part of it either. That’s the rest of the fun. It’s the one time of year that everyone, kids and adults, can dress as crazy as they want. Or can they? There seems to be so many restrictions at Halloween functions at schools and such these days that it can tend to take the fun out of it. Nothing too scary or gory. Your costume can’t have this or that. Etc, etc, etc. I mean Halloween is supposed to be scary right? I get it, especially at school, there are younger kids that might get scared or some things are just not age appropriate but let the kids have fun and don’t go overboard with the restrictions. It’s one day a year. Kids are adorable sources of endless amusement, so much so that a long running television show chronicled the “darnedest things” they’re wont to say. They’re also, however, notorious for saying the most embarrassingly inappropriate things at just the right moment for peak mortification. These are some of the more common themes explored by kids at the top of their lungs, made all the more embarrassing by their penchant for discussing them in public. Shhhhhh! Don’t say that! Kids sure do say the darnedest things. They truly speak their mind. Good article on what kids say in public. Can you relate? This is a great article full of information and ideas to keep kids learning over summer break. This has always been a struggle in our house and a lot of that falls on me. I have to remember that I have to be consistent and participate in the program. It is so easy for me to fall in to the laid back summertime routine and forget to follow through with the “summer program” the family discussed at the end of the school year. Have a read and enjoy. Please chime in with any comments and share what works for your family.